Bravo, La Ciccia! This meal exceeded my high expectations. The chefs at La Ciccia showcase the best of Sardinian cuisine with a panoply of seafood dishes, the longest wine list I have ever seen squeezed onto a single page, and lots and LOTS of olive oil. This is unequivocally one of the best restaurants in San Francisco and it is less than a 10 minute walk from my house. The main reason I have not dined here sooner is because I usually don’t plan my meals out months in advance for just a typical weeknight. However, that is what is required at this quaint and extremely popular neighborhood restaurant. We received warm greetings in Italian as we entered the door. Immediately, the smells permeating the air around the kitchen tantalized our olfactory senses, which gave us confidence that we were about to partake in a very special meal. Italians understand the importance of long meals and the “gioie della tavola”, or the joys of the table. In Italy, so many memories are created around the dinner table. Thus it seemed only appropriate to share the dishes we ordered, which had varying ingredients, portions, flavors, and degrees of heaviness. We started with an antipasta of fresh sardines, appropriately named after Sardinia, the island in which they were first discovered. These delicate fish, bathed in olive oil, garlic, parsley and breadcrumbs, melted in our mouths. High in Vitamin B12, Vitamin D, and omega fatty acids, it is convenient that this tasty dish is also very salubrious. If you are looking for a heart-healthy plan, then this Mediterranean diet is for you. I certainly wouldn’t mind eating this way every day. Next we tasted the acclaimed spicy octopus stew. 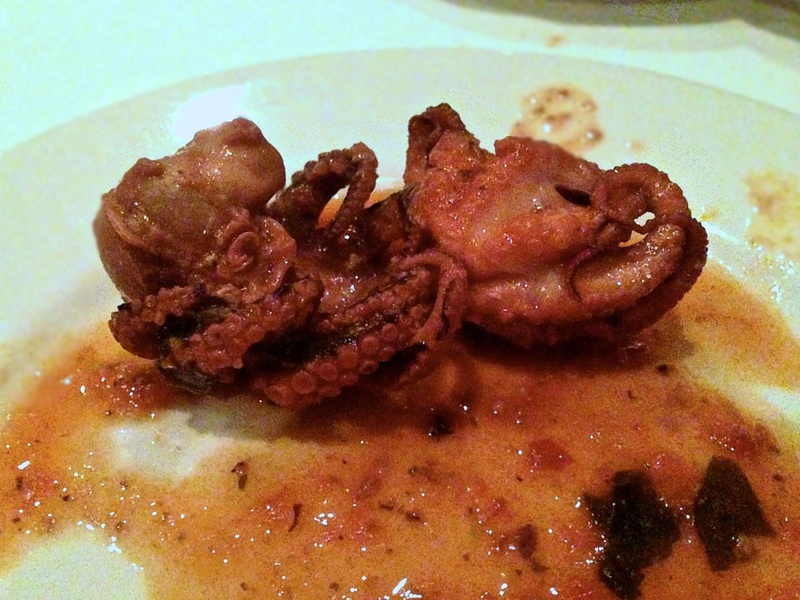 To my surprise, the chef prepared the baby octopi in their full form with the head and tentacles still connected. The spicy tomato broth cooked the octopi to perfection and made them tender, not rubbery in the way most cephalopoda are prepared. I also enjoyed dunking the table bread into the broth; We left no vestiges of the spicy stew behind. For the main course we ordered a pasta dish. 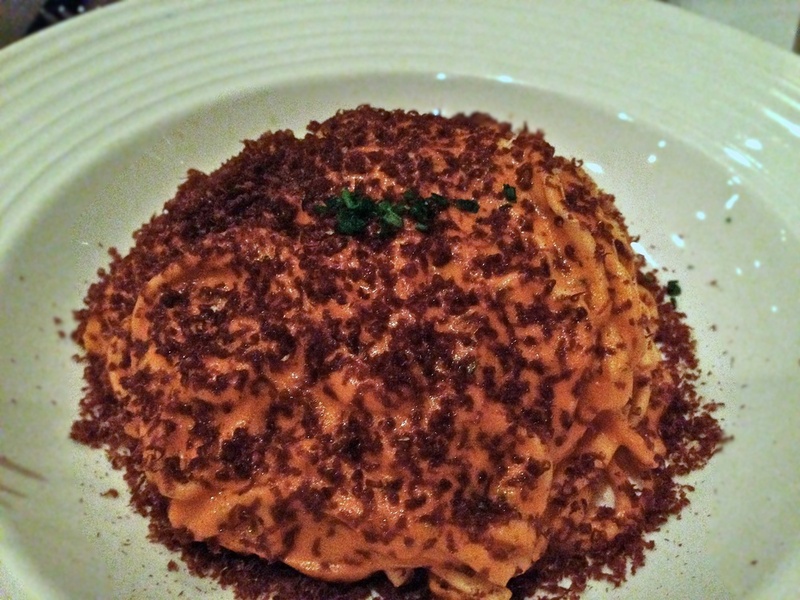 The al dente linguine perfectly intertwined with creamy sea urchin and rich tomato sauce. On top, the chef grated seared tuna heart which added to the ocean-like taste. Super salty and ambrosial, I felt like I had been transported to the Sardinia as I ate this dish. Finally, we finished our meal with a Truta de Arriscottu, which is a ricotta and saffron cake served with honey and layered on top with sliced and peeled almonds. The dish had a wonderful symbiosis as the mild, yet luscious ricotta interlaced with the sweet honey and contrasted with the crunchy almond shelf that rested above it. I will definitely be back here again.